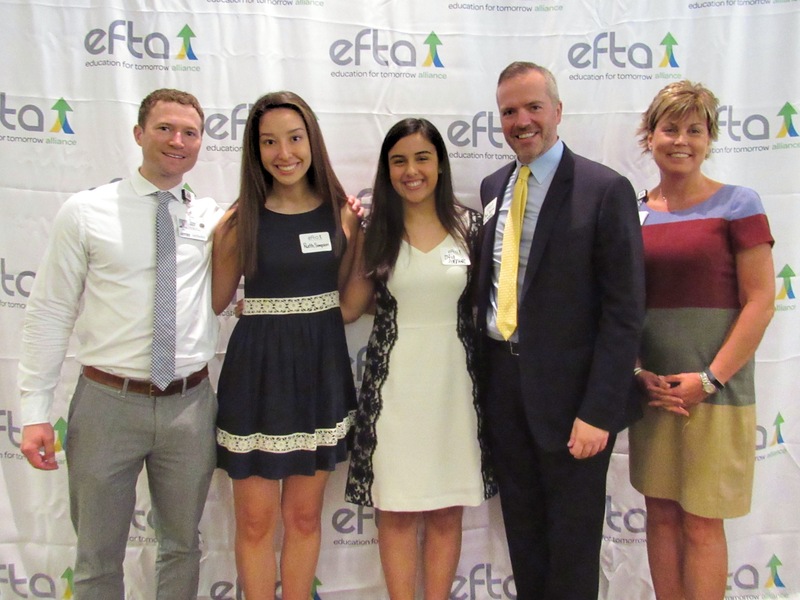 THE WOODLANDS, Texas -- The annual Education for Tomorrow Alliance (EfTA) Student Internship Program luncheon sponsored by Sam Houston State University was held on Tuesday, June 26 at The Woodlands United Methodist Church. More than 200 student participants, intern employers and supporters celebrated their involvement. Dylan Johnson who interned at The Woodlands Area Economic Development Partnership and Ruth Simpson who interned at Houston Methodist The Woodlands Hospital shared their insights on how EfTA’s Student Internship Program has impacted their growth. Dylan explains, “Starting on day one, the staff welcomed me and put me straight to work. I immediately felt valued and important with the tasks that they felt I was capable of doing.” He goes on to say, “I even went to an EfTA marketing committee meeting where I was able to actually contribute ideas”. Staff at Houston Methodist The Woodlands and their two interns Ruth and Sofia celebrate a successful first year with EfTA interns at the Luncheon. Keynote speaker Sheriff Rand Henderson offered students his advice including to cultivate connections, to never quit learning, and to put in the work required for a job done well. The Student Internship Program provides an opportunity for Montgomery County high school students to explore career interests outside of the traditional classroom and gain valuable work experience during the summer before their senior year. This summer, EfTA has placed 118 public and private school students in two-week internships by partnering with 60 businesses from Houston to Willis. Collectively, intern hosts offered students more than 9,440 hours of hands-on learning to encourage early career exploration and development in a variety of industries. The event concluded with three special recognitions. Ashley Rifaat, a recent graduate of The Woodlands College Park High School and 2017 EfTA intern at On Center Software was awarded a $1,000 scholarship from the Mark Woodings Education Foundation. In addition, Mckenzie Morris and Pearlyn Ang helped thank their respective intern hosts, Thais Amaral Tellawi from Amaral Tellawi Law and James Stilwell from Martin, Earl & Stilwell, LLP, for going above and beyond to ensure their interns had an extraordinary learning experience. Education for Tomorrow Alliance is a nonprofit organization dedicated to cultivating business and community partnerships that advance student success. With innovative programs focused on career, leadership, and STEM exploration, EfTA has become the portal through which business leaders can access and strengthen local education. EfTA’s vision is that every student is equipped with the knowledge and skills to be career and college ready. To learn more about EfTA’s programs or to host a student intern in the future, visit www.efta-us.org.